Looking at the current weather situation, summer is defenitely over! So that makes it the perfect time to look back on the things that I wore the most over the summer. I think the fact that I can show you at least 2 different outfits for each of the pieces proves that I absolutely loved these pieces and I will try to make them work in autumn as well (although that might be tricky for my lace espadrilles). Since I am heading to Lisbon in 2 weeks for a weekend trip, I am looking forward to wearing my favorite summer pieces one more time! By the way, here you can find ideas on what to wear this autumn. I've already talked about these jeans a couple of times like here, here and here. Two things are for sure - it's love and I will defenitely buy another pair of this style sooner or later (because they are available in lots of different washes). Over the past season, something happened I always thought wasn't possible: skinny jeans went out of style. Well, they will never be gone completely and they are still such a basic piece in my wardrobe, but I feel like a lot of people stepped away from them in order to wear a pair of jeans not as tight and therefore more comfortable. These Urban Outfitters jeans are the perfect fit, because they are tight over the hips and thighs, but then are a rather straight leg. Last week, I wore them with my black boots and they had the perfect lenght because the jeans ended exactly where the boots begun. So no reason for me to stop wearing them! This jacket can easily be the piece I wore the most this summer. Whenever I needed a light jacket, I grabbed this one! You might think that it's not very versatile because of the embroidery, but it works so well with all of my tops - even the striped ones. Somehow, it only ended up on here once in this post, but I wore it loads. I actually got it during the winter sale in january for 50% off and back then, I wore it with knitwear underneath - which I plan on doing again this year around. This summer, I didn't only try straight leg jeans, I also tried out culottes - and absolutely loved it! These are by far the most comfortable pants I have and I wore them loads this summer. They were perfect for these days when it's too hot to wear just, but too cold to wear shorts. I also got a lot of compliments for them - although I recently learned that they are one of those pieces that women love and men just don't understand. When I was wearing them last week, my brother looked at me and asked whether I seriously considered to go outside in my pyjamas - well, yes, I was because although they might be as comfortable as pyjamas they don't look like some at all (in my opinion). 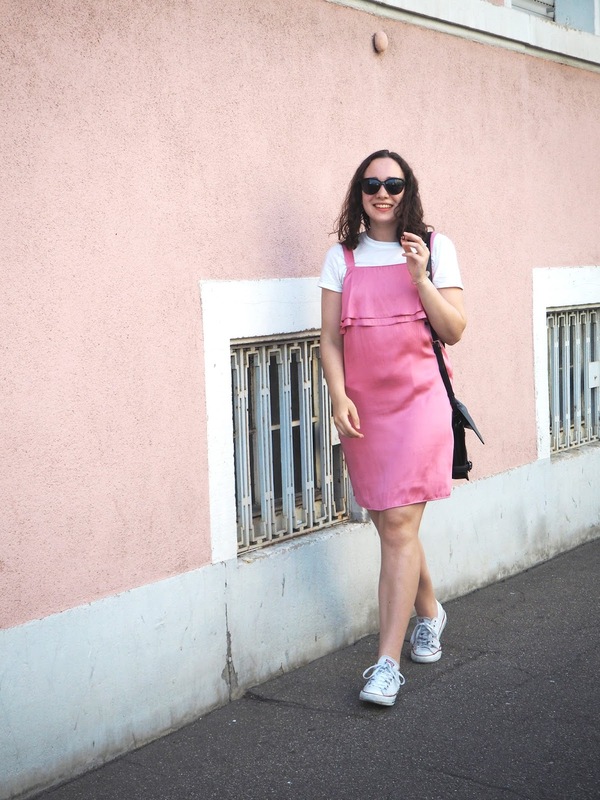 My love for blush pink is nothing new and this bag isn't either, but still wore it loads! Because I couldn't find a blush pink bag I liked 2 years ago, I just sew this myself, so I cannot give you an exact link for this one, but here is a really similar one. The size of it is perfect for everyday life and traveling because I can fit not only my wallet, phone and camera (Olympus Pen E-PL7) but also a bottle of water or an umbrella - so it's really convenient. It's also the perfect accessoire to add a pop of color to a basic outfit like jeans and a white tee. At the beginning of the season, I saw a lot of people wearing these amazing Gucci Sneakers that were embellished with floral embroidery. My love (or should I say addiction?) for anything embroidererd and floral was at a peak back then, so I naturally thought of a way of making them myself because: flowers + embroidery + white sneakers= Julia's dream shoes! After lots of thinking, I found a way to make a pair of sneakers actually really similar to the Gucci ones and I wore them so much this summer. Although they are a statement because of the floral embroidery, they still worked really well with a lot of my outfits and wardrobe in general. You can find the DIY post with a step-by-step guide here. Last, but not least, I absolutely loved these lace espadrilles from Toms. They are my second pair of toms and you can read the story behind them here. They are not only super comfortable (I seriously consider taking them on my trip to Lisbon in 2 weeks) but they are also a great summer shoe when you're not a big fan of sandals (just like me). In general, Toms is a brand I love to support because of their One to One policy where they gift a pair of shoes to kids in need for each pair purchased - so amazing! Which pieces have you worn the most this summer? The raw hems make these jeans so much more fun! I actually distressed them by myself because they were laying in my closet for quite some time. Now, I love wearing them again. Thank you so much! Love them, too.